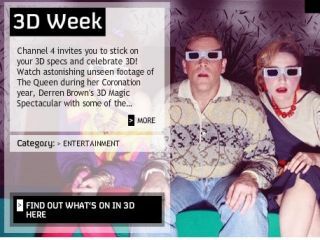 Weeks after announcing its intention to host 3D content, Virgin Media has put the first 3D programmes up on its catch-up service. "We're adding 3D content for the first time," a Virgin spokesperson told us before making highlights of Channel 4's 3D festival available on its on demand service. "We will also be making the 3D episode of Chuck, aired on Virgin1 in August, available in TV Choice," the spokesperson added. "We are also working on getting some additional content such as The Greatest Ever 3D Moments, which will be part of C4's festival, but it's not confirmed for our on demand service at the moment." The content will be available until mid-December, though to view it in 3D you'll have to hot foot it down to either Sainsbury's or a Virgin Media shop to get hold of some 3D glasses. Virgin Media, who recently launched an online searchable listings site to allow easy browsing of its 4,600+ hours of VOD content, also told us that a new search function on its EPG is being rolled-out. There are plans to further improve the on demand interface in 2010. Virgin Media already has the BBC's iPlayer and supports HD streams, as well hosting the ITV Player and 4OD on-demand services. The company recently reported that 55 per cent of its customers are regularly using its on demand services, making a record 66 million views each month on average. Use of BBC iPlayer on Virgin Media's platform accounts for about a third of all BBC iPlayer views.